What is Social Media & Blog (Latest News Trend) Service of Medipedia platform? Medipedia is a blockchain startup that aims to revolutionize the healthcare industry by providing medical consumers with an easy way to connect with and get treated by reliable doctors and healthcare institutions. The Medipedia platform has been designed to provide a range of services for the benefit of both medical providers and consumers. 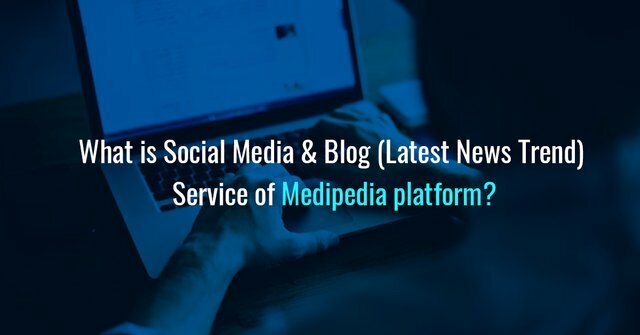 In this article, we will discuss the Social Media & Blog (Latest News Trend) Service feature of the Medipedia platform. Social media and blogs have been the most common method for medical consumers to get information and news about the medical industry. Even when you are not anyhow involved in the industry and just searching for a reliable doctor for a particular treatment, social media and Google seem like the best option. However, relying on information provided by free social media tools is not always a feasible option. Moreover, getting an appointment with the information found on social media is not very easy. This is where Medipedia comes in. The Medipedia platform has been associated with social media and blog feature through which medical users and institutions get themselves updated with the latest news, information and developments of the medical industry. The platform uses the decentralized nature of the blockchain to gain access to relevant information and updates in the real time. There is also a built-in verification system to automatically scan the information to stop false advertising. But the system works in a very different way than the common news channels. It provides Medipedia users with a gateway to reliable information and reviews. For example, if a patient has to go through a specific new treatment, they can open a channel and invite other platform users who have already gone through the same treatment. They can then consult with each other and trade information. Apart from the news channel, there is a blogging portal on the Medipedia platform where the service users can contribute medical news and updates from the industry experts, bloggers and leading platforms. This will not only increase the information capability of the platform but also it will enable users to find all the relevant medical information in one place. The information on the Medipedia blog can be contributed by anyone, including the platform users, medical institutions, pharma companies and doctors. This may include news about a new medical treatment or technology, about a new drug on the market, an ongoing research, or any other medical innovation. The platform can also be used to promote new drugs or treatment.